Energy smart thermostats automatically adjust your home’s temperature by following your programmed instructions. Set your programmable thermostat to lower your home’s temperature when you’re at work and to raise the temperature to a comfortable level just before you arrive home. Digital programmable thermostats can save utility costs. Seven day programmable thermostats let you program your heating temperatures for the entire week. Call and make an appointment that’s convenient for you. We’ll show up on time, listen to your heating and air thermostat needs and make recommendations. We promise to take great care of your home. Our heating and air technicians wear shoe covers, put down drop cloths, are trained to perform the work you need and will thoroughly clean up the work area. We follow up with a phone call to be sure you are satisfied. We stand by everything we do. 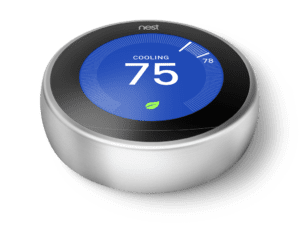 Call Scottco now for thermostat repair, replacement and installation for your Amarillo, Texas area home – 806-355-4663.